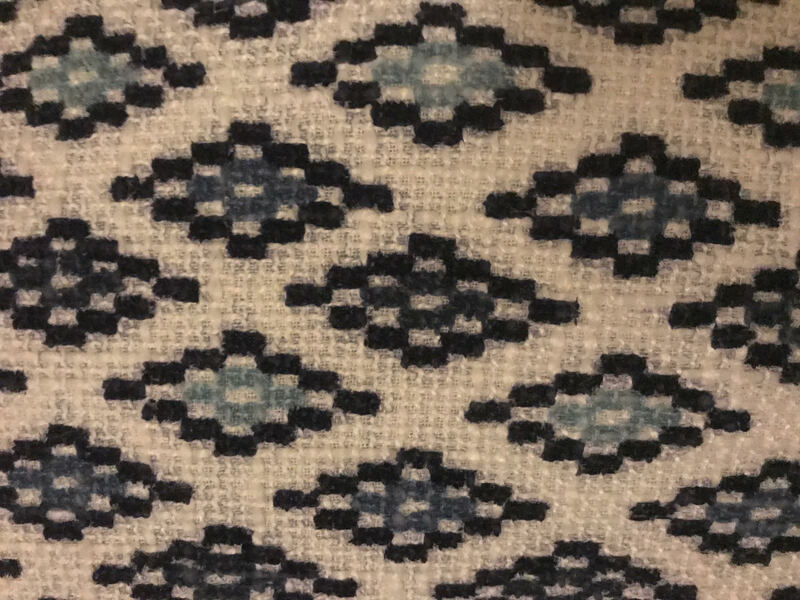 I think with this pattern that is apart of one of my pillows really shows how contrast can affect a pattern. The dark blues stand out against the white background, however, I found my eyes drawn to the lines of the white before really seeing any of the colors within the diamond patterns. The separation between the diamonds creates almost a dot-like aspect of the diamonds and the white then becomes the defining lines. The white is most definitely used to create a harsher definition for the diamonds because it creates those intense contrasts. The two different hues draw your eyes to the dots of the pattern while also creating a pattern within the larger pattern as well. I think it is very interesting how the hue and different colors interact. I know that white isn’t always ideal however I think it works very well here. The use of multiple hues of blues within the different diamonds most definitely draws my eyes in different directions I felt that in this small section it made me feel as though I was jumping from one to another even though it was structured. Due to the colors changing in the diamonds I ended up jumping all over and not having as much of a consistency between all of the diamonds in comparison to the strict white lines. The Analogous blues work really well with each other simply because if they were complimentary I feel as though the overall feel of the pattern would be highly overwhelming and my eyes wouldn’t know what to look at first. Thinking about what this would look like with complimentary colors there would have to be a low saturation to make it less loud and look more appealing to the viewer’s eye. Overall other than the white background I think that the pattern is successful.